Want to make sure your mental health is positive? Write down at least five things you are thankful for and link-up with us! I am so happy to see that Thankful Thursday has been a success and you wonderful ladies enjoy linking up! I give thanks to God for all that I am blessed with. What if you only have today what you thanked God for yesterday? That question always resonates in my head. The weather! It's been so dreary on this side of the world the past two weeks or so. We haven't had a sunny day in literally two weeks. Wednesday was our first day in two weeks!! I am not thrilled how hot it is already...but yay - finally some sun shine! One of my darling high school friends made an ap for iPhones/iPods, etc. I'm so proud of him! Over the course of the year, they made what is known as Fuzzy Cubes. If you enjoy playing puzzle games, I highly recommend it! If you decide to download it - let me know what you think! I'm also thankful for winning some great giveaways the past couple of weeks! I've one Essie nail polish, make-up brush, some great samples (thank you Kate!) and a super cute key chain (thank you Savannah!) One of the samples was of some urban decay primer - I've been debating about the Naked palette - I really like this primer - so I think I might cave and grab the palette! The perfume sample is delicious, too - DKNY. The key chain makes me smile every time I grab my keys. My cousin's baby was born on leap year! 8lbs, 7oz - 20 inches. I can't wait to meet her! Awww what a nice post. That is really a lot of things to be thankful for. Every night before I end the day I always sit and think of all the lovely things that's happened for that day. Each day that we wake up is a special present. Have a beautiful day! ha:) i had the weather at the top of my list this week too!! but looks like you beat me... 81 degrees!! jealous! Oooooh new baby!!! Adore newborns, and how special to be born on the leap day! 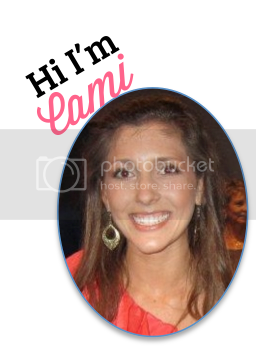 Hi Cami, I have had computer problems this morning and I am just now able to visit. My hubs rebooted or did something and it worked. I also have my computer almost full with the many photos I have uploaded so I am in the process of putting them on a hard drive. New thing for me to do. One more thankful thing is my hubs who knows a lot about computers. HA! I love to read your lovely thankful list with photos. 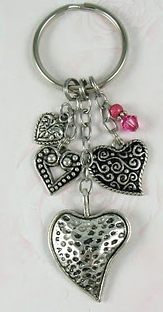 Your new key chain just says LOVE!!! I was thrilled to hear of the Leap Year birth. Congratulations to your cousin and family. The baby is beautiful. You are blessed with people who love you. It is no surprise to me. Yesterday at bridge we celebrated Leap Year by bringing in food and one of our players celebrated her Leap Year birthday. There are 24 people in our bridge group and we meet in our community center every Weds. We love to play. I wanted to let you know my daughter just sent me a photo of Ashley's new hair cut. She ironed out the curls which I love but I think she looks so cute. She was a bit sad to lose her long hair but she is glad she did it for such a good cause. I am adding it yo my post. I would love to have weather in the 80's right about now! 50's in Nebraska is considered a heat wave in March. This is soooo good. I love positive posts like this. And I wanna see some pictures of those new clothes! Oh, you bought some new clothes, Cami! I am looking forward to seeing the new spring clothes. It's always fun when we have a little extra money to spend on ourselves. What am I thankful for? My five senses. I have been very grateful for them lately. Happy Friday, dear Cami. This is a great meme. I just found your blog while blog surfing. I will definitely link up next week for sure. Newest follower. I love this!! My sister and I did a "Thankful November" series where we started each post with a reason why we are thankful. It definitely is a mood booster! 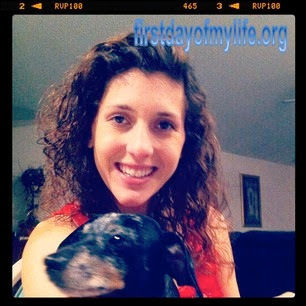 This is my first time on your blog and I love it...newest follower! Thanks for linking up with my thankful thursday post! I am glad I found you :) I didn't know you were doing something similar - love it!! You wins were awesome ones...I so need a good keychain! Mine is scary and I'm really bad and keep my car and house key seperate and am always misplacing them! Your hair is so pretty! I have naturally curly hair too...I need to find a good product!